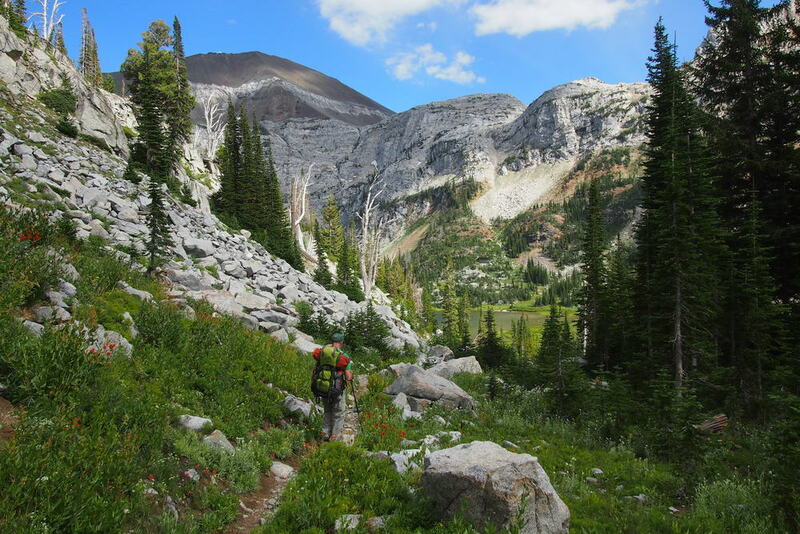 About 19,000 years ago, a visitor (had there been one) to what was to become Wallowa County would have found, not a shimmering blue lake, but instead a rugged wall of rock and gravel embedded ice. This was the melting edge of a glacier extending back into the upper Wallowa mountains. The ice had formed hundreds of years earlier from falling snow high in the mountains and had been carried by the steady flow of the glacier down to lower and warmer elevations where the glacier was melting. This long, slowly flowing river of ice had scoured rocky debris – everything from huge boulders to tiny grains – from the the mountains as it moved, and this debris was being released from the ice at the edges of the melting glacier and dumped in sinuous piles. Later, around 10,000 years ago, the climate was warmer, the wall of ice and rock had melted away, and the sinuous piles of rocky debris left behind when the edge of the glacier melted back into the mountains were a basin filled with water flowing down from the mountains, forming the shimmering blue lake we know today as Wallowa Lake. From the north end of Wallowa Lake, if one looks south toward the opposite end of the lake, on the left is the bare high wall of the east moraine, on the right is the smaller and forested west moraine, and behind one is the terminal moraine (of which Iwetemlaykin State Heritage Site is a part). These moraines are the debris piles left behind by the glacier. 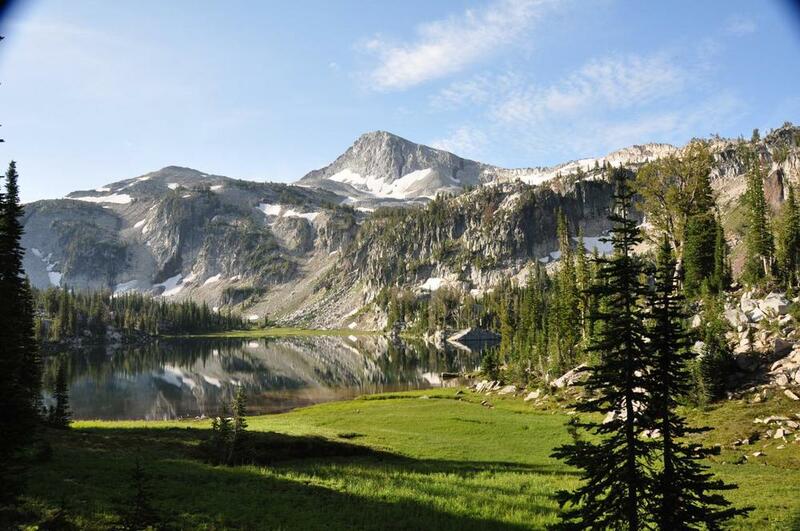 The process of advance and retreat of glaciers occurred several times going as far back as perhaps 200,000 or 300,000 years before the present, and the undulating terrain surrounding Wallowa Lake marks the edges of several glaciers from periods when the climate cooled. This history is easily seen in the aerial photo from Leon Werdinger Photography. The Wallowa River flows out of the mountains into the south end of Wallowa Lake and exits the lake at its north end, flowing through the terminal moraine and from there onward to the Columbia River and the Pacific Ocean. Prior to entering Wallowa Lake, the river serves as spawning grounds for chinook salmon, the land-locked variety of sockeye salmon trapped in Wallowa Lake by the dam at the north end of the lake. 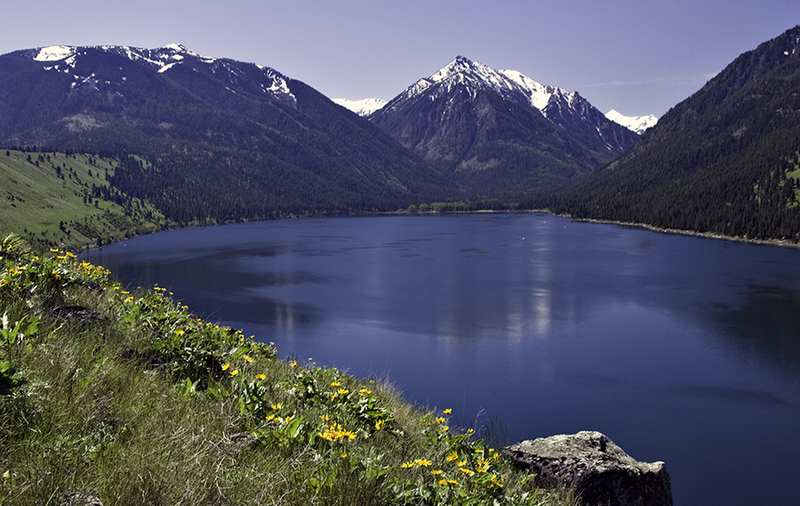 Wallowa Lake is nestled within glacial moraines on the east west, and north. These moraines are the most dramatic examples of glaciers ability to transport rocks scoured from mountains. As the glacier exits the mountains reduced snowfall and warmer temperatures allows the glacier ice to melt and therefore pile up the materials excavated from the ridges and alleys above. Between Joseph and the north end of Wallowa Lake, you drive over the terminal moraine, the furthest point the glacier reached about 17,000 years ago. The lateral moraines along the lake shores illustrate how deep glacial Ice filled the basin of Wallowa Lake. The lake bed itself was gouged out to a depth of nearly 300 feet. The rivers name, from Nez Perce language translates to “Fish. Trap”. For thousands of years the Nez Perce diet was based on salmon that swam up the Columbia River, Snake River, and Grande Rhonde River to spawn in the pure, sparkling Wallowa River waters flowing from the glaciers snowfields, and rain falling in the Wallowa Mountains. Today Chinook Salmon and Steelhead Trout still spawn in these waters, but not sea run Sockeye Salmon. Rafting the Wallowa River/Grande Rhonde rivers from Minam to Troy, Oregon or on to the Snake River in Washington is a popular summer activity. Oregon is a state rippled with mountain chains: the Cascades, Coast Range, Blue Mountains, and, in the northeast corner of the state, the Wallowas—high granite peaks that are often likened to the Swiss Alps. 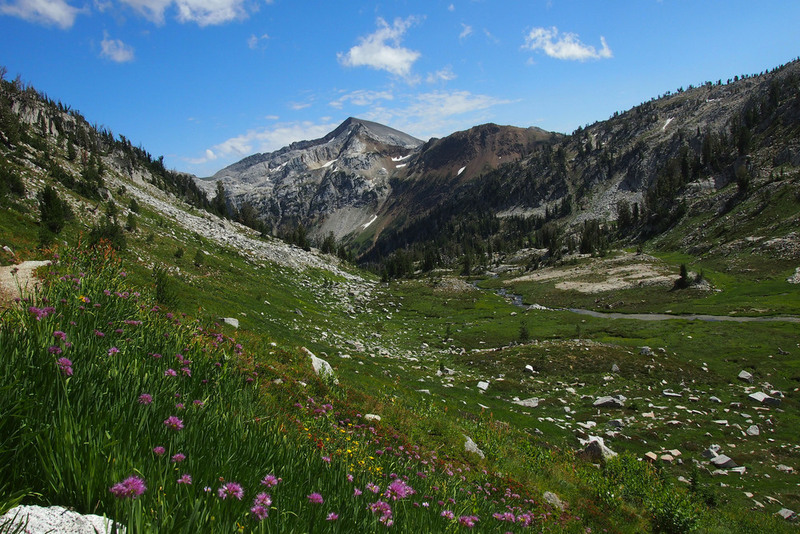 Within the range is the Eagle Cap Wilderness, home to alpine lakes and meadows and elk, cougar, bear and bighorn sheep. 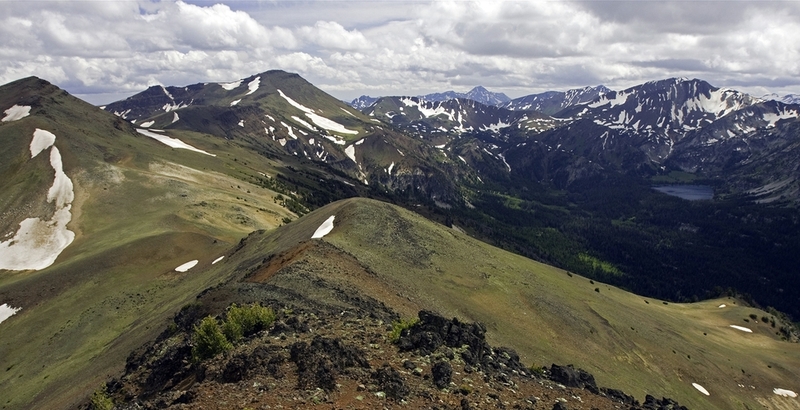 A person interested in birds will be happy to know the Wallowa Mountains are home to over 300 species of birds. This area is the only place in Oregon that includes the range of some bird species. The mammals here range from mice, squirrels, and bats to moose, elk, deer Bighorn Sheep and Mountain Goats. Carnivores include cougar, Bob cats, Wolverine, Black Bear, Coyote, and wolf. 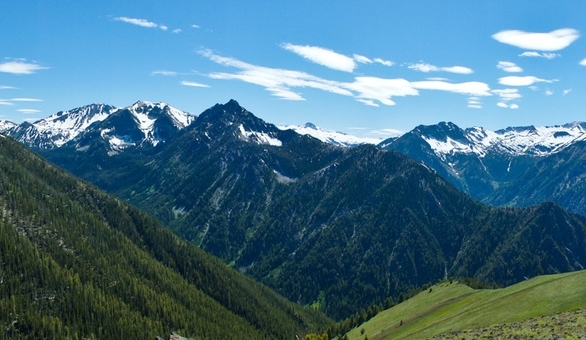 While the developed area around Wallowa Lake Lodge is a wildlife sanctuary, the surrounding National Forest and the Eagle Cap wilderness do permit hunting and trapping, therefore your opportunity to see these wild animals depends on your ability to observe carefully and quietly. Bees, butterflies and other insects provide delightful, easily observed wildlife as hundreds of insect types flit from flower to flower in the meadows. Please share your wildlife sightings with other guests at dinner or breakfast in the Camas Dining Room or in the lodge lobby. As you drive from Joseph to the lodge, all along the lakeshore are typical shoreline shrubs: Mock Orange, Willows and Service Berries. However, on your left, the kinds of plants growing on the moraine change every quarter mile or so as you approach the mountains and the Lodge. First, near Joseph, the East Moraine’s floral display is dominated by grasses and Arrow leaf Balsamroot. Both can tolerate this dry environment far from the mountains. Within two miles, junipers and Service Berry shrubs find enough moisture to survive. Next, Ponderosa Pines outnumber junipers, then Douglas Firs take their place, and just as you reach the south shore of Wallowa Lake, Grand Firs and Larch (Tamarack) join the forest mix. Having arrived at the lodge,you have just experienced shiny of the diverse, beautiful environment awaiting your exploration. The homeland of the Nez Perce people – in their language, the Nimiipuu, “The People” – covered over 13 million acres of present-day Oregon, Washington, Idaho, and Montana, including all of what is now Wallowa County. As the U.S. Indian Claims Commission later recognized, the Nez Perce were the largest, most powerful and influential Indian tribe in the 19th century from the Cascade Mountains to the Bitterroot Mountains. The final resting place of Old Chief Joseph, Tuekakas, father of Young Chief Joseph, Himmatoowyalahtqit, which one passes when driving from Joseph, Oregon toward Wallowa Lake Lodge. In 1855, the Nez Perce negotiated a treaty with the United States at Walla Walla that retained a nearly 8 million acre reservation at the heart of their traditional territory. Under the 1855 Treaty, the Nez Perce also reserved permanent rights to fish, hunt, gather, and pasture animals throughout the original homeland, rights that exist and are exercised to this day. The Wallowa Mountains, and Wallowa Lake, whose names are a Nimiipuu word, were unusually significant places within the Nez Perce homeland. 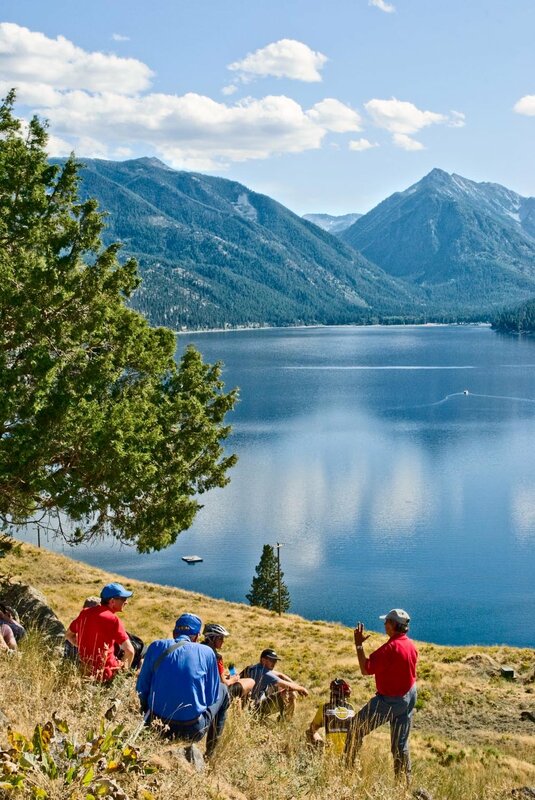 It is no overstatement to say that Wallowa Lake and its environs remain a sacred place to the Nez Perce today. An Idaho gold rush in the early 1860s brought thousands of trespassing miners onto the Nez Perce Reservation and led to the infamous Treaty of 1863, under which the United States through coercion took ninety per cent of the 1855 Reservation. The 1863 Treaty split the Nez Perce as a people as well. Several Nez Perce bands ignored the treaty until 1877, when the threat of force by the U.S. Army led to the 1877 War, essentially a fighting expedition by the resisting Nez Perce bands as they moved toward Montana and the Canadian border. The war ended just short of that border on October 5, 1877, after a last battle near the Bears Paw Mountains, in the snow, with most key Nez Perce leaders dead. In one of American history’s most famous speeches, Chief Joseph, Himmatoowyalahtqit, reportedly spoke these words in the aftermath: "Hear me, my chiefs. I am tired. My heart is sick and sad. From where the sun now stands, I will fight no more forever." The route of the Nez Perce War of 1877 is preserved today through the congressionally-designated Nez Perce National Historic Trail, which begins at Wallowa Lake. Today the seat of government for the Nez Perce Tribe is at Lapwai, Idaho, on the 770,00 acre Nez Perce Reservation. In summer, days are long and warm, and nights are cool. Day temperatures in July and August are in the mid 80s (Fahrenheit), dropping into the 40s at night. Please note that the Lodge is committed to your quiet, relaxed and comfortable stay … free from telephones, elevators, television and air conditioning. Wi-Fi is available for your convenience. Pets and smoking are not allowed in the Lodge, Cabins or anywhere on the grounds. Wallowa is a Nez Perce word for a type of fish trap built by Native Americans in the river just below the outfall of Wallowa Lake.